Back in September, I won a Glogirly contest. The only Glogirly contest I’ve ever won. The prize wasn’t for me; it was for my Uncle Vince. He collects Star Wars memorabilia. I knew he wouldn’t have this. I so wanted to win it for him because he and Aunt Marta do so much for my peeps. How much does Uncle Vince love Star Wars? He had a Yoda ice sculpture at his wedding reception although I’m certainly a more stunning Yoda. When the package came, TW tried to get me to pose with the swag. I defiantly refused! What’s in it for me? She had much better luck getting Uncle Vince to pose with it. It made our day to see the smile on his face when he opened his Christmas gift. Merry Christmas Uncle Vince! Thanks to the crew at Glogirly for the pawsome giveaway. At least Uncle Vince appreciated the prize, even if you didn't want to pose with it, CK - and really, since it was for him anyway, that's what counts, right? At least this time around. COOL! So did Uncle Vince WEAR Yoda ears at his wedding?!? We're SO happy the Star Wars swag went to a die-hard fan. Brilliant swag and we see you all had fun. Have a marvellous Monday. High paw to Uncle Vince. The Star Wars swag is so fun. That was a cool win CK! May the furs be with you! Catastic gifting! Purry nice of you and he looks purry happy too! so nice of you to give away your winnings! I would have slept in the bag, at least from September through December. Did you at least get a chance to nap on it? - Crepes. 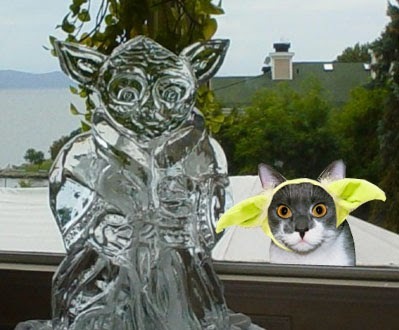 Your Uncle Vince had a Yoda ice sculpture at his wedding reception? How COOL is that!? You certainly made him a very happy man with the giveaway prize! I think you made Uncle Vince's day (maybe his year) by giving your prize to him sweetie. Very generous of you. CK! How awesome that you won this and gave it to your Uncle Vince! We bet you made him very happy. Yaaay this is so brilliant. Great to win something so special! Oh no question about it that you are a WAY more stunning Yoda but then again you're a way more stunning EVERYTHING. Oh yeah, Uncle Vince definitely looks happy! ConCATulations, CK. We're glad you were able to make your uncle's holidays so joyous! I went to the first Star Wars movie 18 times. Never before or since have I been so enamored with a film. Hurray for your Uncle Vince! Oh that's so cool! We bet he loved his pressie!